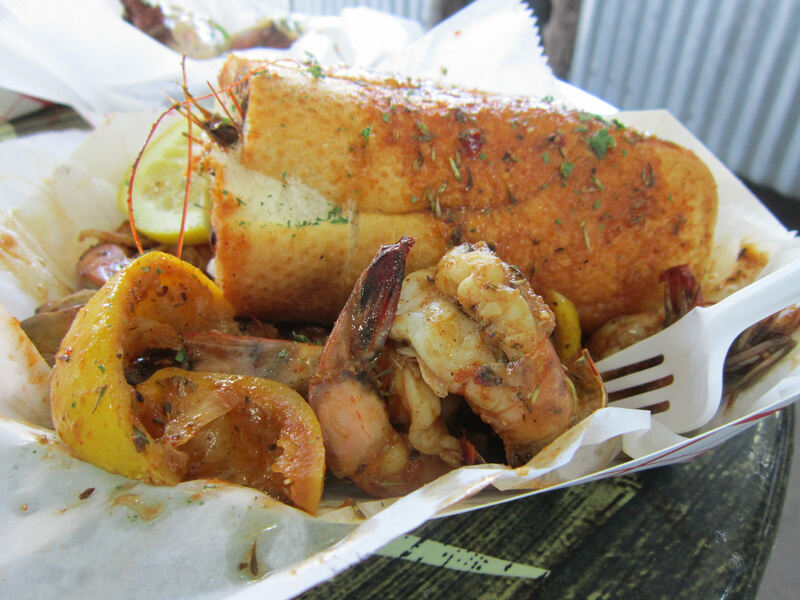 2015 Road Trip Photos #32: Southern Seafood Showdown, Round 3 « Midlife Crisis Crossover! 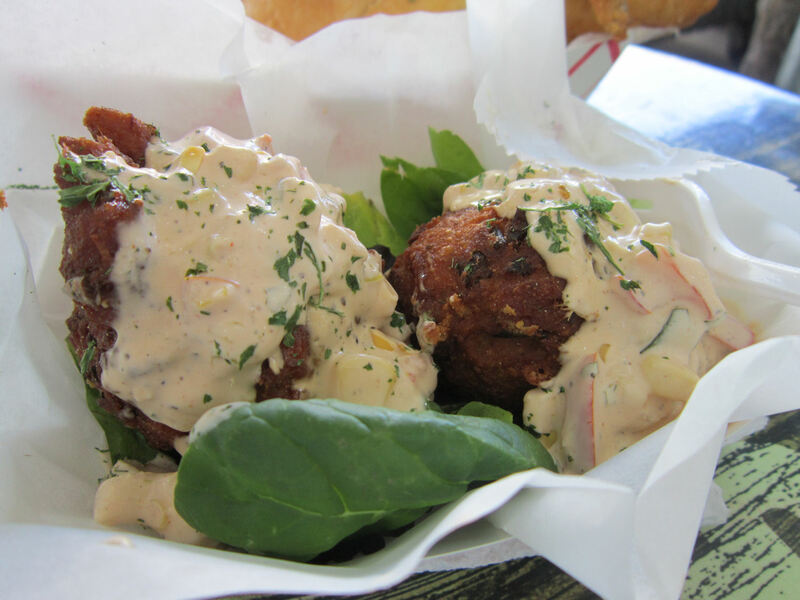 Crawfish beignets: in which New Orleans cuisine achieves its ultimate form. For this year’s scenic tour of the American South, even if everything else went wrong or turned out boring, we kept our hopes high that the cooking would prove to delight our senses and heap shame upon our own meager kitchen skills. On Day Four we found two restaurants — one a fine-dining restaurant, the other an open-air market booth — that delivered the goods and won the week. 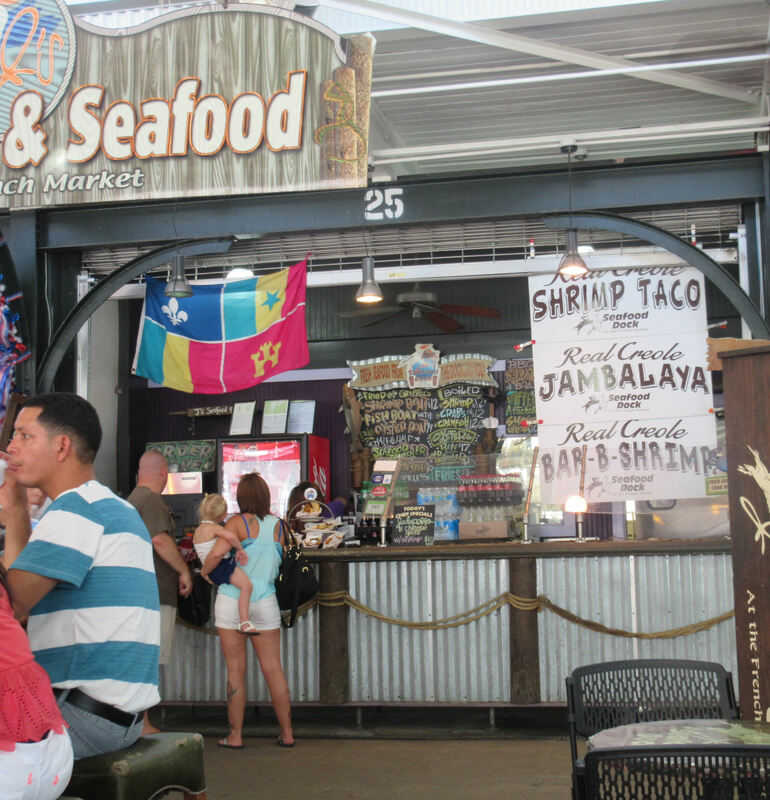 During our walk through the French Market, we stopped for lunch at J’s Seafood Dock, the stand with one of the least polished setups and the most colorful chalkboard. They were out of the first two menu items we tried to order. We waited 15-20 minutes before our entire order was delivered. By that time I’d grown impatient and skeptical, and was already making mental plans to go drown my disappointment in ice cream when we were done with this fiasco. 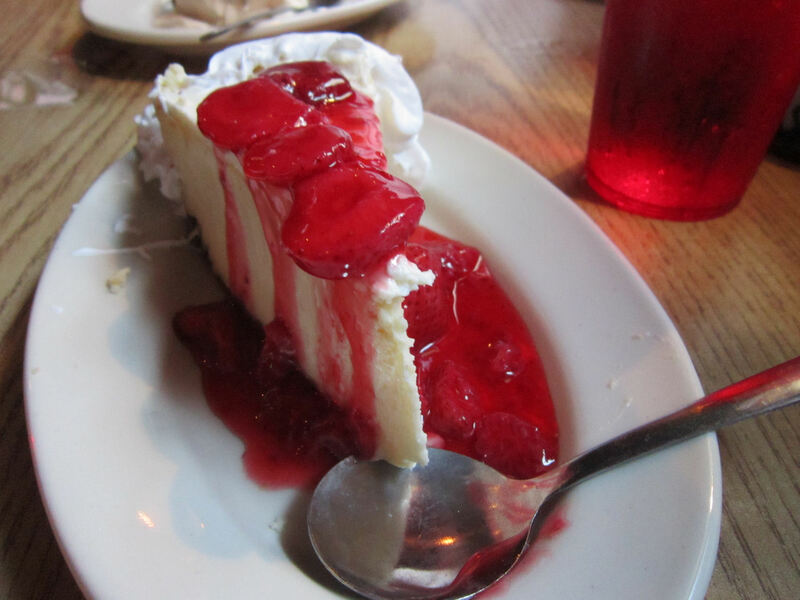 And then we ate and it was glorious. The crawfish beignets shown above cost more than twice as much as the non-meat beignets at world-famous Cafe du Monde, but they were ten times better, so the food math worked out in our favor. 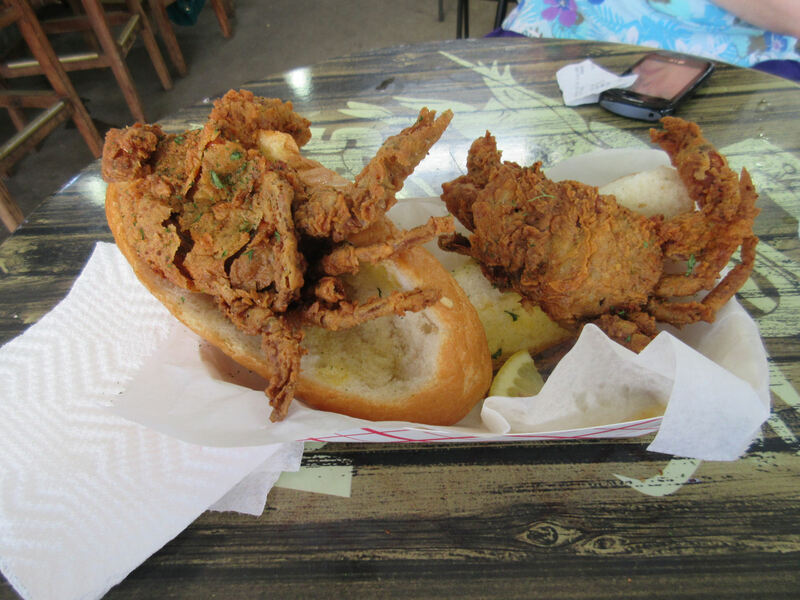 Soft shell crab was a new thing to me, and I wasn’t sure if there were parts meant to be left uneaten. I scarfed them all down anyway without medical incident or regret. Not a crunchy shell in the entire basket. I wish the crab had outweighed the bread, though. But my meal was a school lunch compared to my wife’s order of Cajun BBQ shrimp. Spicy foods are one of her mortal enemies, but she opted to go adventurous. They were indeed spicy, but her eyes went wide with dual sensations of pain and paradise. We didn’t believe the judges on Chopped who insisted that shrimp heads can be the most flavorful part if prepared properly. Oh, how right they were. NOW we believe. Afterward we stuck around and relaxed for a spell in the convivial French Market ambiance, taking time to digest and to let every last negative thought about the pre-meal inconveniences fade away. Later that evening, our dinner plans took us to a different direction — an upscale brick-‘n’-mortar establishment called Oceana. 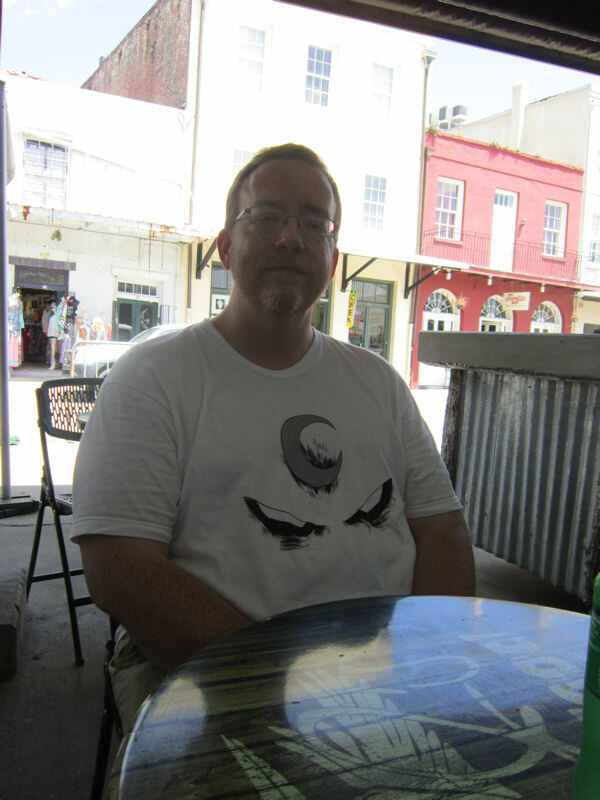 It was the only place we ate in the French Quarter that had a long line to get inside. We took that high demand as a positive sign in itself. Serving dinner till 1 a.m. for the discerning night-owl. Our wait was a mere fifteen minutes, much better than the hour-plus we dreaded could happen. 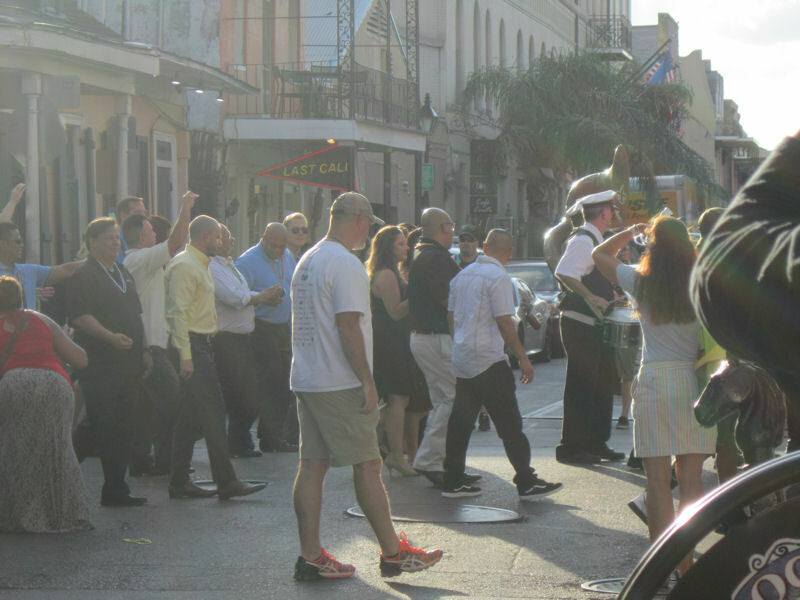 While we hung out, several dozen folks paraded past us in unison up Bourbon Street, including several in a line of motorcycles and an entire jazz band marching and living it up. We wondered if this might be one of those jazz funerals we’d heard were a thing in New Orleans, but we didn’t see a coffin or any pallbearers. Maybe their funerals are more symbolic than ours? 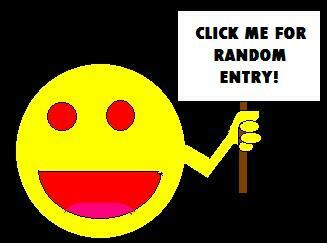 Or maybe someone among them was carrying an urn full of ashes. We’ll never know because it’s just not a polite question to ask. Once inside, we learned our wait was largely caused by the necessary arrangements to accommodate a party of nineteen who’d beaten us there. We would’ve come over sooner, but our lunch and our post-walkabout exhaustion tided us over for hours. Regardless, service was eventually expedient and the results were worth the wait and then some. 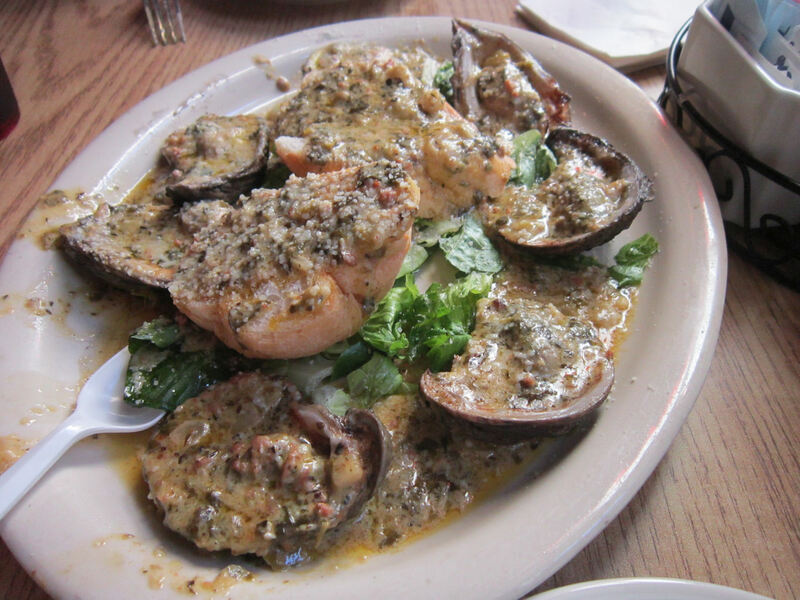 Our appetizer: Oysters Rockefeller in a sauce with spinach, smoked bacon. and cooking liqueur, topped with parmesan. 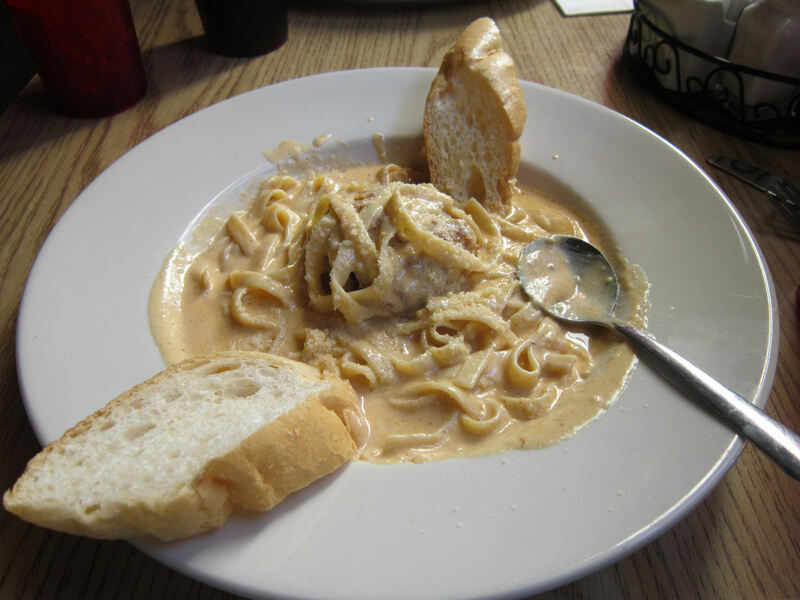 Anne was afraid of getting burned out on so much seafood and compromised a tad with their Crab Cake Pasta. 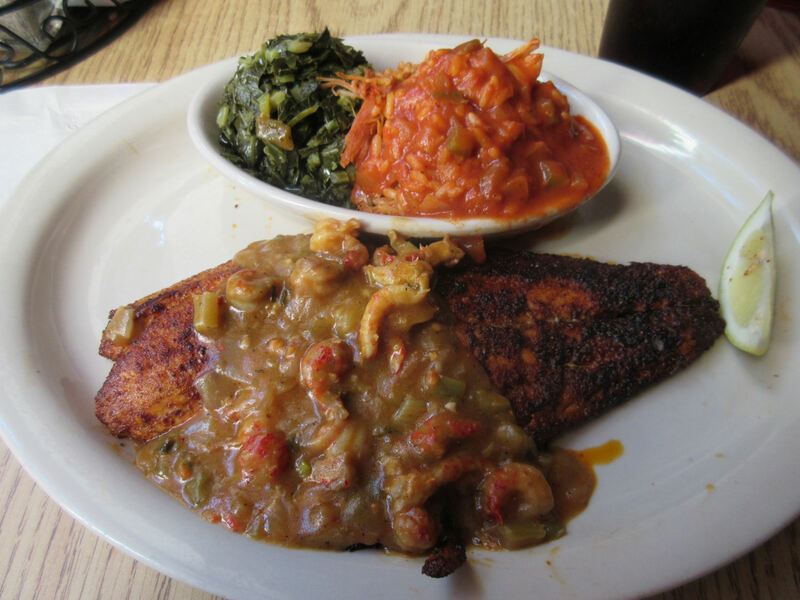 I was still all-in on the seafood front and enjoyed their Blackened Redfish Etoufee, served with small samplers of jambalaya and collard greens. 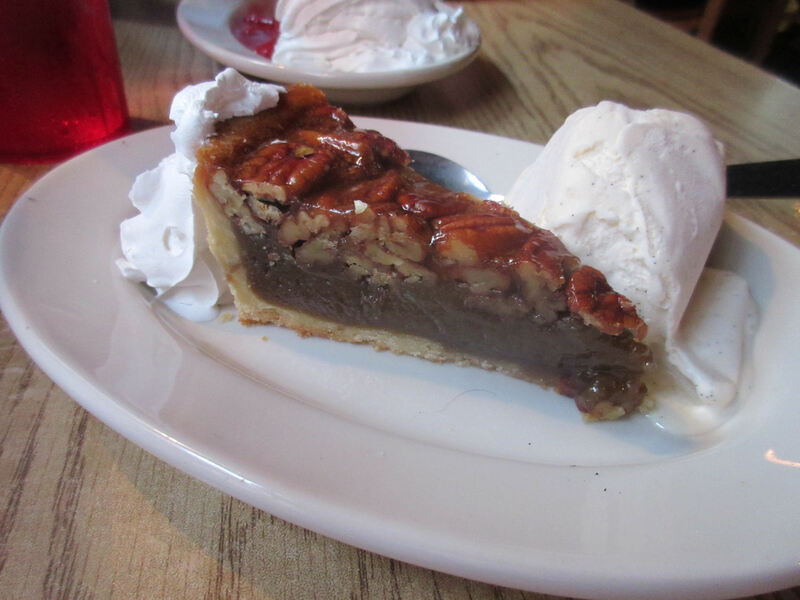 …and I with a slice of Kentucky Bourbon pecan pie. Thankfully for rare haters of alcohol like myself, cooking kills all traces of booze flavor. 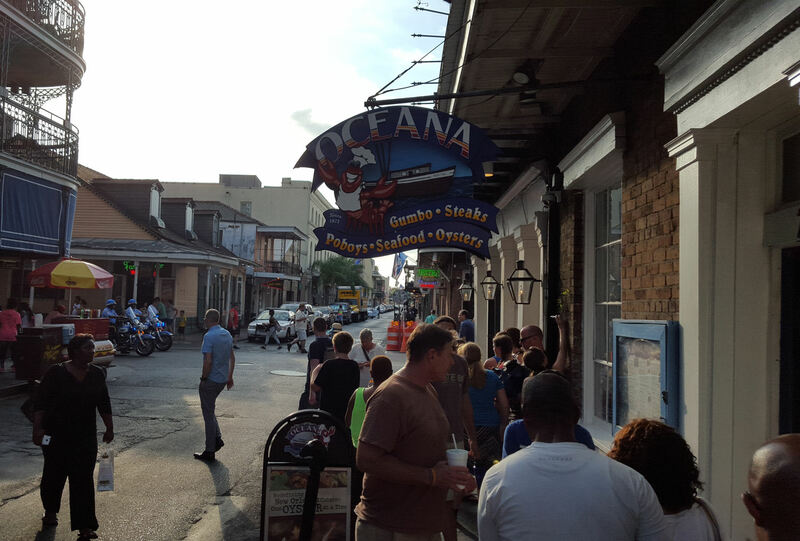 Regardless of all the panicky safety warnings in our travel brochures, places like J’s and Oceana were upstanding role models that helped remind us why we’d come to New Orleans in the first place.